I don't know what the booksellers Billings, Harbourne & Co of San Francisco had in mind back in 1883 when they issued this solemn New Year's greeting. Could they have found a more unhappy looking figure to represent their wishes for a Happy New Year? The reverse side offers a poem, which may help explain the forlorn look on the young woman's face. Apparently she is separated from her loved one and his words express a longing to see her on New Year's Day. K. Van Tassell is credited as the artist, but I can't find anything about an artist with this name. L. Prang & Co. of Boston is the publisher of this card in 1883, and there is a lot of information available about this prolific chromolithographer. A German immigrant to Boston circa 1850, Louis Prang became a popular printer of collectible trade cards. The Philadelphia Print Shop offers prints of Prang's work as well as a brief biography of his life. At this site, I learned that Prang, as his business grew, began offering color copies of famous paintings and published the magazine, Prang's Chromo: A Journal of Popular Art. 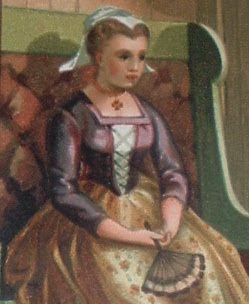 I wonder if this trade card depiction of a young Fraulein is from a well-known painting (not to me, obviously)? 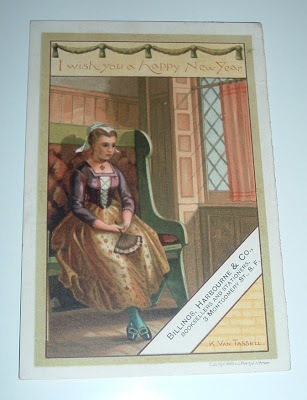 The booksellers Billings, Harbourne & Co., for reasons forever lost to history, chose this forlorn young, lovesick lady to greet their customers with good wishes for the new year ahead (1884?). 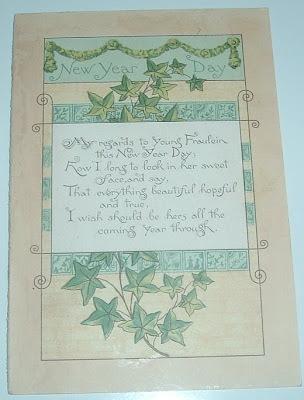 Well more than a century later, this curious bookseller wishes you all a very happy and prosperous 2010! This recent addition to my collection is a publicity photo from the 1939 movie, Fast and Loose, a B movie at best that depicts a rare bookseller and his wife sleuthing around a crime scene involving a murdered bookseller and rare books theft. This particular photo was actually run in an Argentine newspaper, but I'd bet the same photo was used anywhere the film needed promotion. And from reviews I've read, it needed a lot of promotion. The film Fast and Loose was the second in a series of three films inspired by the book Fast Company, by Harry Kurnitz (Dodd, Mead, 1938). My copy below is a second printing of the first Pocket Books edition in 1943. 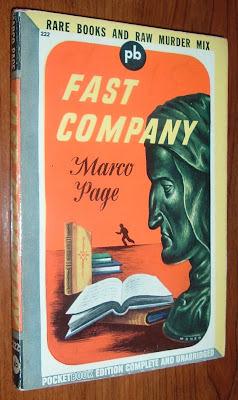 Marco Page was the pseudonym Kurnitz used. Both the book and film have slipped into obscurity. I can't find a copy of the film anywhere to buy or rent, but if you'd like a first edition of Fast Company, which spawned the film series, there are actually a few copies to be had. But be prepared to spend around $500 and up. Apparently, the original book is at least valuable to collectors of biblio mysteries. Interestingly, each film in this series had a different pair of actors in the lead roles of Joel and Garda Sloane (Glass in the book). The first film in the series took the book's title and starred Melvyn Douglas and Florence Rice in 1938. Two follow-ups were made in 1939, with Kurnitz writing the screenplays. In addition to Fast and Loose, which starred Robert Montgomery (pictured in the publicity photo) and Rosalind Russell, the finale in this trio was titled Fast and Furious, with Franchot Tone and Ann Sothern as Joel and Garda. FYI... Robert Montgomery, who is pictured on the right in the publicity photo, was the father of Elizabeth Montgomery, best remembered for her role as Samantha Stevens in the 1960s sitcom Bewitched. For more information on Kurnitz, his book Fast Company, and the Fast film series, MysteryFile.com is an excellent resource as well as this Turner Classic Movies site. There are trailers for the other two installments of this series, but I thought it best to not get too fast and loose with embedding YouTube videos in this post. If anyone really wants more punishment, you can find it. 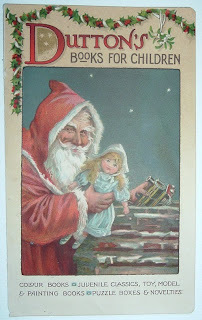 Tonight, boys and girls around the world eagerly await Santa Claus and the gifts he will bring on his magical journey. Accordingly, I thought I'd visit the ephemera of Christmas past with a link to my post last year about this turn of the century (ca. 1900) handbill. 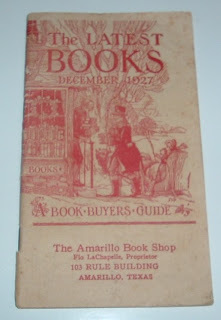 Just in time for Christmas, the Amarillo Book Shop catalog showed up in my mailbox today. But unless I can time-travel, I won't be getting what I'd like to have out of this catalog for Christmas Day. 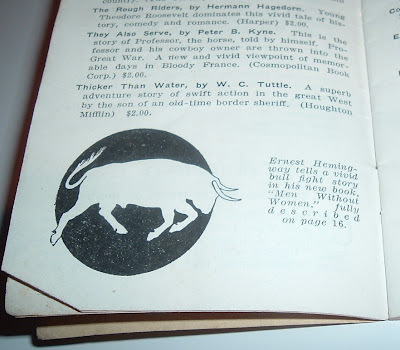 This catalog is from 1927 and features Ernest Hemingway's latest collection of short stories, Men Without Women, for $2.00. Back here in 2009, that same book in as fine condition as the Amarillo Book Shop had it would be in the neighborhood of $10,000. That's a nice neighborhood! Page 8 offers a related vignette and refers the reader to page 16 to see the listing for the book. I like looking through these old book shop catalogs to see what was for sale and for how much. 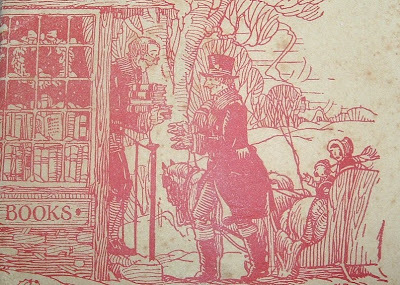 But what first caught my eye was the cover graphic, an illustration in red depicting a winter (Christmas) book shop scene, complete with a one-horse open sleigh. The illustrator is not credited other than by the initials M.D. My ephemera collection includes prints and various formats of illustrations, such as this now, which depict old book shops and the bookselling trade. I am unfamiliar with this one, but I would like to know anything about this drawing and the artist. M.D. could be a local artist in the Amarillo area or this could be a reproduction from a book or other source. For now, it remains a mystery. 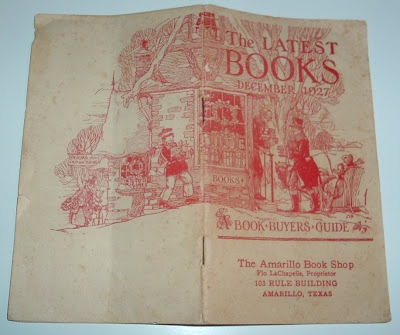 The history of the Amarillo Book Shop also remains a mystery. 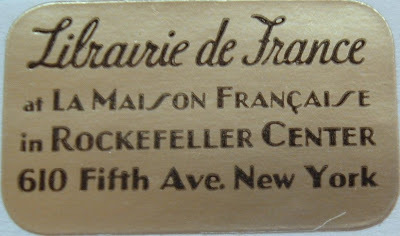 The details I have from the catalog's cover include the business name, the proprietor's name (Flo LaChapelle) and the location (103 Rule Building). The only history I can glean from the Internet so far is that the Rule Building was built in 1927, the same year indicated on the book shop's catalog. So I wonder if the book shop got its start in a new building or if it had existed prior to the Rule Building opening its doors. Either way, the stock market crash of 1929 was a just a few years ahead and would signal the beginning of the Great Depression. In the decade of difficult times that followed, I also wonder just how long the Amarillo Book Shop was able to make a go of it. From the looks of this little catalog, they were well-stocked with a variety of books and probably feeling optimistic about their home in a brand new building. However long that lasted, they appear to have vanished without a trace, save for their December catalog of 1927. Cataloging books the other day, I struggled through a few non-English titles, trying to translate French and German to English to see what exactly I was dealing with. To my surprise, both had their bookseller labels still affixed. I hadn't come across any of these ephemeral bits of the book trade in a while and was getting complacent about even looking for them in more recently published books such as those harboring these labels. The two New York City booksellers, represented here by their inconspicuous labels, were anything but inconspicuous as long-established bookselling concerns with specialties in foreign language titles. 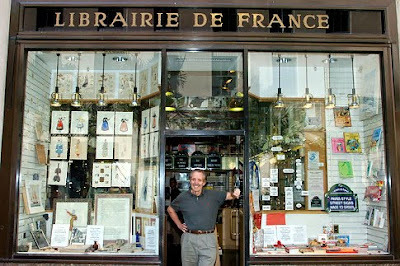 The Librairie de France closed its doors just a few months ago. With rent tripling to about a million dollars a year, they just couldn't stay open in their Rockefeller Center space, where they'd been for 74 years. The picture below, from the New York Daily News, shows the store and its owner, Emanuel Molho, whose father started the business in 1928. But a visit to their Web site offers some solace to customers with the announcement that they will continue operating as a mail order business. Stechert-Hafner has a longer history than its former neighbor above and, surprisingly so, there is scant biographical information online about the principals of this company. They got started in New York City in 1872 as G.E. Stechert & Company. Stechert was joined later by Swiss immigrant, Alfred Hafner, who worked in various positions for the company before his name became a part of the firm's name. 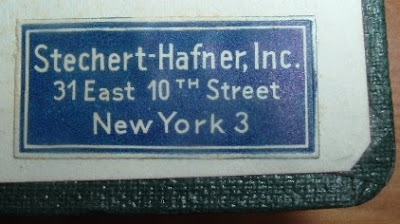 A 1966 obituary in the New York Times indicates that Otto Hafner was the president of the company at the time of his death. The company is described as having offices in London, Paris, Stuttgart, Germany, and Bogota, Colombia. A large international bookselling firm, they imported and exported books in many parts of the world. Countless references can be found on the science, technical, medical, and other nonfiction categories, in which Stechert-Hafner dealt, in languages from around the world. Nine stories of inventory at their New York location were purchased by Richard Booth and moved to his Hay on Wye bookstore, a former castle. The date of the purchase is not indicated in the article at the link above, but Booth started his bookshop in the early 1960s. Perhaps with Hafner's death, the company's beginning of the end was at hand.